Origami box patterns let you use your paper folding skills to create handmade boxes that are both pretty and practical. Learning how to make origami boxes on your own requires a little time and a lot of patience but the results will be worth it. Try one of these box patterns to use as a small gift box or container for small objects. Make this fashionable diamond box by following the pattern below. Just click on the pattern or the text beneath it to open the .pdf file. Then you can save or print the pattern. If you need help downloading the pattern, check out these helpful tips. Click here for diamond box pattern. This box makes a wonderful Christmas decoration or to use for a small gift. Click here for the star box pattern. 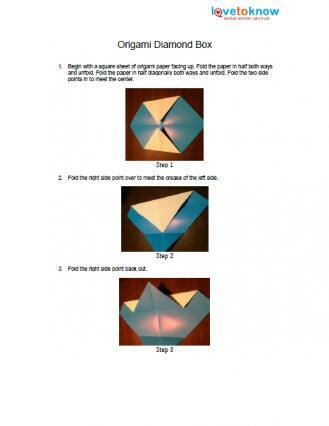 You can find a variety of origami box patterns on the Internet. Making boxes is a great way to practice your paper folding techniques. 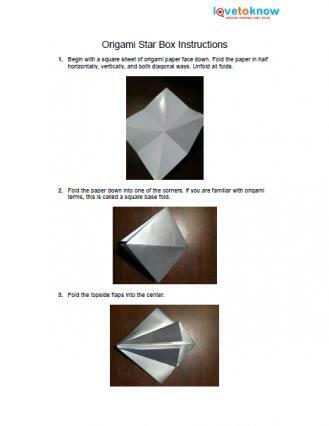 Triangular Compartment Origami Box - Follow the instructions to make a really neat triangle compartment box. It is a practical box that you can use to keep small things organized such as buttons or jewelry. Long Origami Box - This paper folded box is perfect for bracelets, watches or necklaces. The animated instructions are easy to follow and very clear. Origami Gift Box - This cute little gift box has pretty paper embellishments on top and easy-to-follow instructions. Origami Heart Box - Fold a pretty heart-shaped origami box, perfect for your sweetheart on Valentine's Day. These instructions are in video form making them easy to follow. Money Origami Box - Follow this video to fold money into an origami box. This is a creative and fun way to give a money gift to someone. Traditionally, origami does not involve cutting, taping, or gluing your paper. However, when making origami boxes, you may find that some cutting, taping, or gluing is necessary to make the box more durable. When making a box, the weight of the paper you choose can have a significant impact on the final product. Specialized origami paper is very lightweight, but some box patterns may hold up better if you use scrapbooking paper or paper crafting cardstock. If you're interested in recycling, boxes made from birthday or Christmas cards are another possibility to consider. Stamping and painting on your origami boxes can give them a very distinctive appearance. 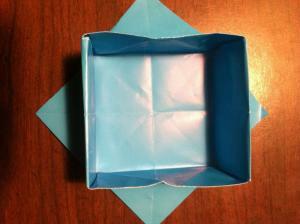 For details, review the Faux Finished Origami Boxes tutorial on the HGTV Web site. Don't be discouraged if your box does not look great the first time you try. Paper folding takes some time to perfect, but once you do, there will be no end to the creative things you can do with your new skill.